The Native American Indians used many symbols and signs to convey different meanings, interpretation and messages. The Interpretation of the Symbols reveals secrets of their rituals and traditions, an understanding of their legends and mythology and their unique view of the world and their surroundings. Please refer to the following section for pictures and information about the Interpretation of Symbols and their meanings. The interpretation of symbols used by the Native Americans is a study and guide to unlocking the language of the symbol, allowing for greater understanding of the cultures of the ancient people and tribes who inhabited North America. The language of symbols and their interpretation reveals an insight and different shades of meaning that would be lost if the time was not taken to make an acquaintance with the interpretation of symbols and the secret meanings and language they convey. For additional information refer to Power Animals. 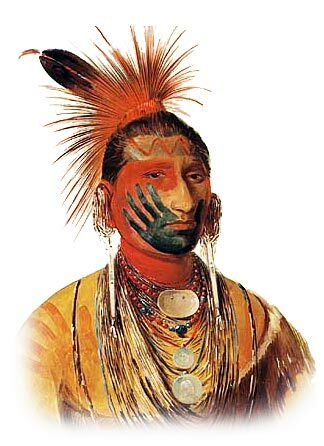 The Native Indian Tribes website is literally crammed with pictures by famous artists such as George Catlin (1796 – 1872) who specialized in paintings and portraits of Native Americans in the Old West. George Catlin had a fierce desire to fulfil his self-imposed destiny as their pictorial historian. His pictures capture portraits of Indians, and scenes of Indian life, during the 1800's that have now been swept away with the annals of time. As you look at each of the paintings it quickly becomes apparent that they are filled with mystery. The war paint they wore was clearly not a random selection of unintelligible lines and colors. The faces, bodies and clothing of these Native Americans are filled with symbols, the meanings of which were a complete mystery. What did the handprints mean on the above picture of the Iowa Warrior? Look carefully there is a handprint on his face and on his shoulder. Did the colors have a symbolism of their own? Why black paint? Why red paint? Questions are raised with each of the pictures of Native Americans. It is necessary to undertake a study of the Interpretation of symbols to increase our levels of understanding of the beliefs and the culture of the Native American Indians. Symbols, Signs and Signals are a means of communication conveying ideas and meanings in a highly visual fashion. The Interpretation of Symbols provide a unique insight into the ancient and mysterious signs and motifs used in the unusual forms of non-verbal communication practised by the Native Americans. Their forms, methods and types of non-verbal communication were not limited to images found in picture writing, they also included Smoke Signals and Sign Language which was developed to enable different tribes to communicate with each other. The following articles will be of particular interest to those interested in the Interpretation of symbols, Motifs, Signs and Signals using these different forms and methods of non-verbal communication. The Symbols, Signs and Signals used by Native American Indians were sometimes easily recognised and understood by many people. Others were private. The use of smoke signals required a strong element of secrecy as messages and intentions communicated via such signals could be seen and by the enemy. The Interpretation of symbols, in these circumstances, were restricted to only the sender and the receiver. Some symbols, motifs and signs were meant to be understood universally, they represented important messages or references to religious beliefs, customs and traditions. But the interpretation of symbols, that were meant to be understood by everyone, were lost when one civilisation was conquered or overtaken by another. History is full of such events, it is not restricted to the Native Americans. The great Egyptian civilisation existed for over 3000 years. Within 100 years of their conquest by the Romans, the interpretation of their form of writing in hieroglyphics, was completely lost. It took nearly 2000 years for these ancient writings to be interpreted again following the discovery of the Rosetta Stone. This is why the interpretation of symbols developed, and used, by Native Americans must not be lost. Unfortunately the symbols left by the ancient Native Americans of the Mississippian culture, the Mound Builders, have already been forgotten. Many of their symbols have lost their meaning and value and are merely perceived as decorative art forms. Understanding the myths and legends of indigenous people help with the Interpretation of Symbols. Many of these stories have been passed from one generation to another by word of mouth but now written references are made to the Interpretation of symbols and different signs. The famous, iconic image of the Thunderbird Symbol is a good example of interpretation and can be compared to other legendary bird monsters such in the Piasa Bird symbol and the mythical serpent symbols of the Mound Builders. Our understanding of these mythological creatures helps with our interpretation of this ancient type of symbol.